Boasting a tour-de-force performance from British screen legend Timothy Spall (Mr. Turner, The King’s Speech, Harry Potter franchise) the highly original, multi award-winning Stanley, A Man of Variety arrives in Picturehouse Cinemas with a series of exclusive Q&As. 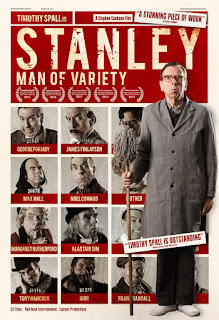 In this darkly funny tale, Stanley (Spall) finds himself in prison for a crime he believes he didn’t commit. Now a lonely, forgotten man approaching his fifteenth year in the old psychiatric facility, he maintains his role as a trustee by cleaning the grim prison interior, which earns him the privilege of watching and re-watching classic videos from his prized collection of memorabilia. When this privilege is withdrawn, Stanley becomes so distressed that he suffers a physical and mental seizure. Soon enough, his beloved heroes - Max Wall, George Formby, Max Miller, Margaret Rutherford, Alastair Sim and more - visit him in hallucinations (all played by Spall) showing their sinister, unsettling side and take him on a bizarre journey through the unbearable truth of his life and incarceration. Directed by Stephen Cookson (My Angel, Steven Berkoff’s Tell Tale Heart) who co-wrote the film with Timothy Spall, Stanley, A Man of Variety won an impressive 16 awards at film festivals worldwide and stands as one of the most original, unmissable British films of the year.